I’ve been visiting Edinburgh Festival Fringe for well over a decade. It’s changed a lot over those years; its geography around the city, the price of tickets, the rise of the free fringe and the use of technology. It’s also grown in size. An amazing feat and an incredible experience. Not only is it a great place to sample a whole host of live performance (and, increasingly, visual art), it’s also a hot bed of ideas to feed my imagination for making creative businesses more successful. One thing that gets me though is the how folk view Edfringe marketing of their shows. The winner by far was a gentle chap who simply offered kids a colouring in picture, advertising his show on the reverse. It was a touching moment of relevance and easy acceptance. It also gave him a moment to talk to the grateful parents and might mean the flyer is retained for longer. Adults may not be inspired by colouring in a donkey, but there might be more you can do with the back of a flyer to keep someone entertained. Edfringe marketing top tip! With over 3000 shows Edfringe marketing can be tough. It’s worth following the venues lead and packaging your show together with similar shows. Why not put together your guide to a day at the festival – 5 shows in easy walking distance. Plenty of people like to follow a plan amongst so many options. 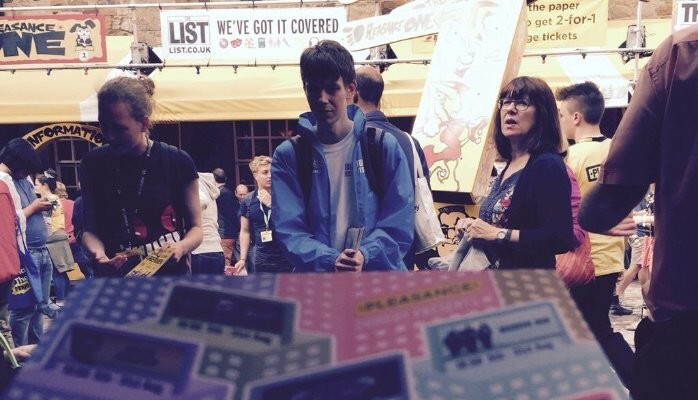 The Pleasance comedy HUB flyer was a great example of Edfringe marketing. Whilst the Royal Mile may be a place people head, getting your offer through is tricky. I was impressed by a few actors who explained to me why their show was a match whilst I queued for Trans Scripts. I also spotted folk targeting family shows to cafes in Leith…it’s a demoralising task, so finding people who might fit your audience makes it a lot easier. It baffles me how few people actually keep the ‘social’ in social media active, but when they do it works a treat. A response and even a conversation from@iansmithcomedy secured our ticket purchase. It truly is an online affair. There’s so much information available and companies who use hyperlinks to connect their copy with previous reviews, websites and video win. You may have a great website, but unless you give me the link I’m unlikely to google you over the person who does. And, if your site is optimised for mobile – forget it, I’m gone.